We work at the intersection of social and environmental justice. Women and girls around the world are robbed of social power and self-determination. Eradicating these injustices is not only a crucial human rights issues, it's also intricately connected with the world's population and the creation of a sustainable planet.. Stories are powerful. We are drawn to them. We remember them. Imagine paying $0.04 USD to reach a person meaningfully. Imagine 67% of new health clinic clients saying that they came to seek services because of an entertaining radio show. These are the real implications of PMC shows.. There is good news. The solutions to our social and environmental challenges are many, and they are progressive. Your donation helps solve some of today's most pressing challenges.. In 2019, United Nation’s demographers expect global population will grow by a net increase of about 81 million people. This will be the result of about 140 million births and 59 million deaths. A great resource for these statistics is the UN Population Division’s data download center. Isn’t it remarkable that the human civilization is expanding by 1.5 million more of us per week? If you like playing with numbers, this works out to 220,000+ people per day. 9,000+ per hour. 150 more per minute. 3 more every couple of seconds. And, yes, for the skeptical reader, these figures represent net growth of births minus deaths. One powerful way to think about this sort of growth is this: what would you actually think if there were 150 more gorillas on the planet every minute? What about alligators? Wiener dogs? Think about it – non-stop, minute after minute, day after day, year after year. Like a huge, rapid mushroom bloom, more and more and more sprouting up constantly. One huge implication of this expansion is that each of these additional people have an inherent claim upon a fair and substantial share of land, food, shelter and other resources: all of which must be extracted from the already suffering biosphere. Because, we are not actually talking about 81 million wiener dogs or fluffy kittens. What we are talking about is 81 million large, environmentally impactful, mammalian bipedal-primates. As of 2017, the United Nations projected that human population could be anywhere between 7.2 (low projection) and 16.5 billion (high projection) by the end of this century. The medium UN projection, which represents their best estimate, is now the highest it has ever been: 11.2 billion in 2100. 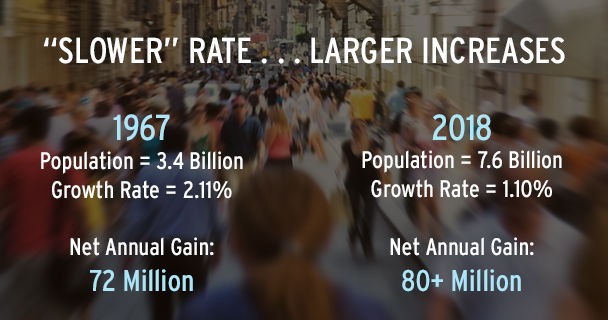 Over 85% of this growth will be driven by sub-Saharan Africa, which is expected to add 3.2 billion people by 2100. The differences between the high, medium and low UN projections are hinged on assumptions about fertility rates around the world. Again, the medium projection uses the UN’s best estimate of fertility trends through 2100 in each country. The high projection calculates population growth at a level where fertility is 0.5 children higher; the low projection calculates at a level 0.5 children lower. Hence, just a 0.5 reduction in fertility around the world could result in 4 billion fewer people by 2100 than the medium projection forecasts. On the other hand, if the world decides to be complacent and fertility tracks at 0.5 higher than anticipated, the planet would then be expected to provide adequately for 16.5 billion.